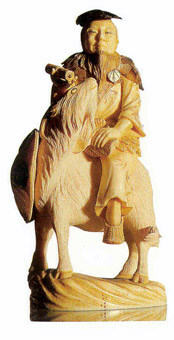 A 19th century ivory statuette of Shennong. As here, he is usually portrayed wearing a robe decorated with leaves from medicinal plants. "In ancient times people ate grasses and drank from rivers; they picked fruit from trees and ate molluscs and beetles. At that time there was much suffereing from illness and poisoning. So the Divine Farmer taught the people for the first time how to sow and cultivate the five grains."